Teachers have asked for “ideas” to get the classroom started with students research projects related to the topics of agriculture in space, tomatoes, the environment, space, space travel, the International Space Station and Mars. Since students can deal with research projects at many different levels of sophistication, the following list presents ONLY some potential research topics for students. They cover a wide range of topics; obviously, science is the focus, but there are also links to other subjects including family studies, nutrition, environmental studies and geography. The list of topics has the potential to be endless. The list was developed using “the availability of resources” as one of the key criteria. It should be viewed simply as a starting point for ideas related to student research. Teachers need to use their professional judgment regarding suitability of specific topics to the particular grade level involved. How does the climate of Mars compare to that of Earth? Review a number of space-related films or television episodes and identify “errors” in how life in space is depicted. The Moon will play an important role in future space travel. Research to find out what the plans are for future Moon expeditions. Is there any true Paleobiological evidence of life on Mars? How can research related to farming on Mars be applied to practices here on Earth? Sputnik went up in 1957. Then, the United States became more active in the space program. What countries are now in the “space race” and what are their major areas of focus? 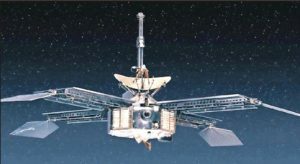 Over 50 years ago, Mariner 4 sailed past Mars and sent back the first ever images from another planet. Choose one of the planets in the solar system and research the images available for that planet. Should human space travel be replaced with robots? Should the exploration of space be controlled/financed by countries or should the process be privatized? Research the medical risks – both physical and psychological – of long treks beyond Earth’s orbit. How can the psychological risks of long-term space voyages be addressed? A company in the Netherlands is promoting a ONE-WAY trip to Mars. What would be the motivation for an individual to take part in such a trip? Research the effect of radiation on the development of plant life for space travel. Is it possible to use solar rays in space to make a space “sailing ship” move through space, thus creating an energy efficient space craft? Research how food will be produced within closed life support systems as a means of enhancing self-sufficiency and crew health during long space missions. Research the topic of “space medicine”. Design a kitchen appliance that could be used on the surface of Mars. Design a greenhouse for implementation on the surface of Mars. Consider Mars’ weather conditions – temperature and moisture availability, chemistry, radiation and gravity. Research the time-line from now until a trip to Mars takes place. Identify one major obstacle to be overcome in the time-line and suggest solutions to overcome the obstacle. Identify an environmental problem on Earth that may be solved by the application of space-based research on Earth; correlate the potential findings from space to the Earth-based environmental problem. What technologies must be implemented to allow the growing of crops on Mars? Is there microbial life in the surface layers of Mars? How will travel to, and working on, the Moon assist in the future plans for space travel to Mars? What is the relationship between science fiction and space travel reality? You have an idea for space exploration. Research how you could find out if it is practical? Develop a timeline of space images available for the planets in the solar system. Compare the exploration of space to the exploration of a new area in the history of the Earth – the Americas, Africa, or the expedition to the top of Mount Everest. Research Newton’s laws of motion and design a demonstration of Newton’s first or third law. The demonstration must be applicable to space travel. A possible extension might involve students’ study of the relationships among force, mass and acceleration [Newton’s 2nd law] and the design of an experiment to test the variables. How can the physical medical risks of long-term space voyages be addressed? Although many young people would like to be astronauts, it is statistically more difficult than becoming a major league athlete. However, there are many alternative occupations related to the space program that will demand scientific and technological expertise. Research one area of interest related to space and/or space agriculture, and develop an educational path it would take to work in this area. On Earth we may have to deal with sunburn as a consequence of working outdoors in summer. 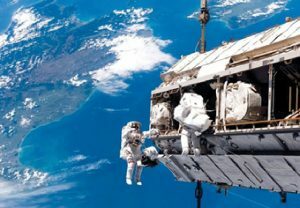 Research the effect of radiation on astronauts and, in particular, on astronauts who may be spacewalking during the construction of the International Space Station. Research one of the following aspects of life support in space – food, water, waste disposal, atmosphere control, or fire protection. Research the earth’s magnetosphere – how it works, its components, the benefits for us on earth, how it is detected from spacecraft. Tomatoes are the focus for this study; research to determine the role of other potential food sources that have been studied for long-term space travel. Outline the advantages and disadvantages of each. Rank order a list of potential foods for long-term space travel. Design a habitat for living on Mars for 6 astronauts for a period of six months; the habitat would include bedrooms, bathrooms, exercise area, kitchen, laboratory and medical station. Research the nutrition issues facing astronauts when travelling to and from Mars. Investigate the climate and physiography of Devon Island in the Canadian north to determine the rationale for choosing this site for Mars simulation studies. Research areas of the Earth that might be used for simulations of the Mars environment. Rank order your choices and provide a rationale for the ranking.